Back in 2000, Bryan Singer directed the first X-Men and helped kickstart the modern era of superhero movies. Singer also helmed 2003’s X-Men 2 but he let Brett Ratner take over 2006’s X-Men: The Last Stand. Via director Matthew Vaughn, the franchise returned to its origins with 2011’s semi-reboot X-Men: First Class. Singer returns to the series for 2014’s X-Men: Days of Future Past, an effort that manages to combine the “throwback” cast of First Class with the actors from the first three X-Men films. Past starts in a dark future in which robots called Sentinels hunt down both mutants and the “normal humans” who aid them. Professor Charles Xavier (Patrick Stewart) leads his X-Men against the Sentinels but it seems likely they’ll lose this war. We learn that the DNA of mutant Mystique (Jennifer Lawrence) helped create the Sentinels back in 1973. Professor X wants to stop this at the source and the powers of Kitty Pryde (Ellen Page) can send someone’s consciousness into the recent past, but she believes that a trek all the way back to the Nixon era would kill the time traveler. Except for Wolverine (Hugh Jackman), perhaps, as his regenerative abilities should allow him to survive the trip. Wolverine’s mind goes into the past to join with his circa 1973 body and stop the Sentinel program before it starts. When I found out Vaughn wouldn’t come back for Past, I felt disappointed. I really liked First Class and thought it offered easily the best film of the X-Men franchise, so I wanted to see what else he could do with the characters. I also wasn’t too excited to greet the return of the original X-Men franchise cast. That’s not meant as a slight on any of those actors, of course, as the first three movies boasted a whole lot of talent. However, I thought those performers had run their course. We saw many of them in three films – even more for Jackman, who had a cameo in First Class and also starred in two separate Wolverine efforts – so I wanted a First Class 2 that focused on the new actors. Sure, they’d also be in Past, but they’d have to share the spotlight with the prior castmembers, which seemed like an unfortunate compromise. And a bit of a cop-out, I think. 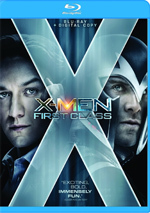 While it didn’t do poorly, First Class earned a lot less than any of the prior three X-Men films. Perhaps the powers that be always intended a crossover between “old” and “new” casts, but it feels like a panic move to ensure box office receipts. The return of Singer comes across the same way. If you remove those first two X-Men movies, he’s not done all that well as a commercial director. 2006’s Superman Returns did muster $200 million in the US, but that ended up as a disappointment given expectations for the film. Singer’s two subsequent efforts – 2008’s Valkyrie and 2013’s Jack the Giant Slayer - couldn’t even approach the $100 million mark, so I suspect the greener pastures of the X-Men franchise began to look pretty good to him. Excuse the cynicism of the last few paragraphs, but given the direction I hoped the franchise would take after the delightful First Class, the decisions behind Past disappointed me, and the product on the screen didn’t change that attitude. While Past offers a decent X-Men adventure, I don’t think it ever becomes especially memorable or involving. Perhaps it just bites off more than it can chew. Past boasts an astonishing cast, and that leaves it with a lot of mouths to feed. It can’t nourish all of them, so too many of the actors get left on the sideline. At its heart, the movie focuses on Wolverine, Mystique and the young versions of Professor X (James McAvoy) and Magneto (Michael Fassbender). I don’t have a major issue with that concentration, though I think we could use less of Wolverine. Except for First Class, he dominated the other X-Men movies, and he got his own adventures as well. I understand he’s the rock star of the X-Men, but his prominence in these movies feels a bit lazy, like those involved can’t imagine an X-Men tale that emphasizes anyone other than Wolverine. The sluggish nature of the narrative doesn’t help. At the core, Past gives us a pretty simple story related to Mystique’s development/fate, but it conveys this tale in a rather plodding manner. Occasional moments enliven the proceedings, but too much of the movie progresses in a slow way that makes it less than enthralling. Matters do pick up in the third act, but by that point, it threatens to be too late. I’ve now watched Past three times, and I continue to hope it’ll eventually click with me. So far that hasn’t happened. Though not without its positives, Past feels like a long journey that lacks a great payoff in the end. Footnote: Past includes a post-credits sequence that hints at the next X-Men film. X-Men: Days of Future Past appears in an aspect ratio of approximately 2.39:1 on this Blu-ray Disc. This became a satisfying image. From start to finish, sharpness looked good. Only the slightest hint of softness affected wide shots, and those examples occurred too infrequently to cause problems. Instead, the film looked concise and well-defined. No issues with jagged edges or moiré effects occurred, and edge enhancement was absent. I also failed to detect any source flaws. In terms of colors, the movie featured a palette that favored yellow, teal and orange. None of these tones became overwhelming, so the elements don’t overwhelm like often becomes the case in modern movies. Across the board, the hues looked fine within their design parameters. Blacks were dark and deep, while shadows appeared clear and smooth. I thought the movie consistently looked positive. As for the film’s DTS-HD MA 7.1 soundtrack, it offered a dynamic superhero experience. With a variety of action and ambient elements, the audio brought the events to life in fine fashion. Battle sequences added the greatest punch, and the pieces used all the speakers to great advantage. Quieter scenes contributed good breadth and smoothness as well. All of this meant the audio filled out the spectrum in a nice manner. Disc One provides two versions of Past. We get both the Theatrical Cut (2:11:35) as well as a new Rogue Cut (2:28:45). While “The Rogue Cut” might just sound like a cute title, it’s actually a literal descriptor of what to expect. The Rogue character (Anna Paquin) had virtually no role in the theatrical Past, but in this extended version, she plays a moderately substantial part. Most of the film’s first two-thirds remains essentially the same, though. The chapter menu helpfully indicates “Alternate Scenes” and “All-New Scenes”. The “Rogue Cut” doesn’t mention Rogue until chapter 28, and prior to that, it includes nine alternate scenes. How much extra running time did those nine segments deliver? Three minutes, 18 seconds, so don’t expect a lot of variations for the initial two-thirds of the film. Chapter 30 becomes the first “all-new scene”, and it’s from that point on that we get the majority of the unique footage in the “Rogue Cut”. Obviously, much of this connects to the Rogue character, but I won’t discuss details so I can avoid spoilers. When I discuss alternate versions of films, I tend to focus on the big picture: does the “new” edition work better than the old one? In my opinion, no, the “Rogue Cut” doesn’t do much to improve the original. Most of my problems with Past stem from its first two acts, which I think move too slowly. The film works fine in its third section, mainly because the action picks up as matters come to a head. The “Rogue Cut” tinkers with the third act but neither improves nor harms it. Again, because most of this version’s added footage shows up in the portion of the film that already fared pretty well, it doesn’t create a more satisfying story. It’s interesting to see the changes but the “Rogue Cut” fails to create a more satisfying movie. Note that in addition to the same post-credits tidbit also found on the Theatrical Cut, the Rogue Cut throws in a brief “mid-credit” shot. Disc One also includes two audio commentaries. Alongside the Theatrical Cut, we hear from director Bryan Singer and writer Simon Kinberg. Both sit together for a running, screen-specific discussion ofs the project's development and how Singer came back to the franchise, story/character areas, editing and cut scenes, action, stunts and effects, cast and performances, music, sets and locations, shooting 3D and related topics. Singer and Kinberg pair to offer a terrific commentary. They touch on a nice variety of subjects and do so in a way that seems both honest and entertaining. No slow spots occur during this involving, informative piece. To accompany the Rogue Cut, we get a second commentary with Singer and editor/composer John Ottman. Both sit together for this running, screen-specific take. 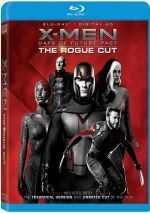 While they touch on other areas, three topics dominate the commentary: music, editing, and changes made for the "Rogue Cut". After the pleasures of the Theatrical Cut's commentary, this one comes as a disappointment. Not that it flops, as it includes a reasonable amount of useful material, especially related to the alternate version. Still, the track sags more than I'd like and doesn't turn into a great chat. On Disc Two, the main feature comes from Mutant Vs. Machine, a nine-part documentary. Taken as a whole, it fills a total of 52 minutes, 41 seconds with info from Singer, Kinberg, Ottman, producers Lauren Shuler Donner and Hutch Parker, comics writers Len Wein and Chris Claremont, costume designer Louise Mingenbach, production designer John Myhre, cinematographer Newton Thomas Sigel, property master Simone Leclerc, SPFX supervisor Cameron Waldbauer, assistant supervising sound editor Skip Longfellow, supervising sound editor John A. Larson, sound designer Warren Hendriks, re-recording mixer DM Hemphill, visual effects supervisor Richard Stammers, additional visual effects supervisor Matt Sloan, and actors Hugh Jackman, James McAvoy, Patrick Stewart, Michael Fassbender, Ian McKellen, Peter Dinklage, Jennifer Lawrence, Anna Paquin, Ellen Page, Daniel Cudmore, Booboo Stewart, Shawn Ashmore, Fan Bingbing, Nicholas Hoult, Halle Berry, Omar Sy and Evan Peters. “Machine” looks at story/character areas and the original comics, what Singer brings to the film, cast and performances, costumes, sets and production design, photography and shooting 3D, music, editing, and sound design, various effects, aspects of the “Rogue Cut”, the film’s reception and what to expect from the next movie. With almost an hour at its disposal, I hoped “Machine” would present a pretty deep look at the film’s creation. While it gives us a mix of good elements, it tends to focus too much on happy talk. We still learn a reasonable amount about Past, but it’s a lackluster product overall. X-Men Unguarded runs 30 minutes, 11 seconds and offers a “roundtable” chat with Singer, McKellen, Fassbender, Stewart, Kinberg, McAvoy, Page, Dinklage, Berry, Sy, Peters, Jackman, Hoult, and Ashmore. We get reflections on the film series and specifics about Past, with an emphasis on cast and performances. A few minor insights emerge here and it’s fun to see the actors all together, but we don’t get a lot of substance from this piece. In addition to a Sneak Peek for the 2015 Fantastic Four film, we get a gallery. It breaks into three areas: “Storyboards” (534 frames), “Costumes” (36) and “Concept Art” (389). These offer good images, but the interface can be a bit clunky, especially during “Concept Art”, as that breaks down into a bunch of subdomains. In relation to the rest of the series, X-Men: Days of Future Past offers a middle of the pack experience. It keeps us moderately involved but it never turns into anything especially exciting, and this disc’s “Rogue Cut” fails to improve the original. The Blu-ray brings us solid picture and audio along with a pretty good roster of supplements. Maybe someday I’ll wholly embrace Past, but after three screenings, I remain only mildly invested in it.